When Ebony Allen sent this one through and said "Leesa NEEDS to be here", I was in total agreement. Leesa is one of those warm, wonderful women I came across on the web and has been integral for the promotion of Indigenous bloggers, amongst many other things. But I'll let Ebs talk about that, and hope you all enjoy her profile on Leesa! 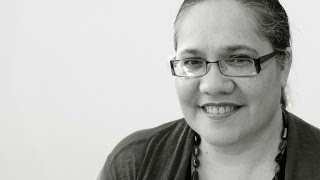 Leesa Watego is one of those dynamic, deadly women that it is really hard to describe because she is and does so many amazing things that you’d be perplexed as to where to start. In no particular order, Leesa is a proud Murri woman, an entrepreneur, a mother, social justice warrior, a writer + blogger + tweeter + vlogger and educator. I met Leesa online a few years back on twitter (where all the cool peeps hang) and have continued to be inspired by her tenacity in continually innovating the way that the world sees First Nations peoples. While she, like most mothers, would say her greatest achievement is her children (and she’s probably right if we go by a recent blog post by her thirteen year old daughter Annie), what I’d like to highlight in terms of one of Leesa’s achievements is the Deadly Bloggers network. In 2009 Leesa had the idea of collating a list of Aboriginal and Torres Strait Islander peoples who blog. It started off as a link list on Leesa’s personal blog and in 2012 evolved to a facebook page, blogspot directory and a twitter account. At present, DeadlyBloggers has a dot com, an extensive list of blogs on almost any given topic and an inaugural Deadly Bloggers Carnival; a month of rotating posts by First Nations Bloggers. The concept of creating a database and a network of Aboriginal and Torres Strait Islander bloggers is simple yet so powerful. Through it and accounts like @IndigenousX, we are able to take control of our identity and demonstrate to the world the diversity of our First Nations people, our experiences, our thoughts and the way we express ourselves. While you can find Leesa on pretty much every social media platform, I recommend finding her through her main blog Not Quite Cooked.